Homepage Mobile Phones Motorola Mystery Sony Ericsson Julie WP7 phone, is this it? Mystery Sony Ericsson Julie WP7 phone, is this it? A long, long time ago Sony Ericsson was rumoured to be working on a Windows Phone smartphone that had the codename Julie, and back in March of last year some images that were purported to be the Sony Ericsson Julie surfaced after which the smartphone seem to had died a death. However it appears that the Sony Ericsson Julie may not had died after all. 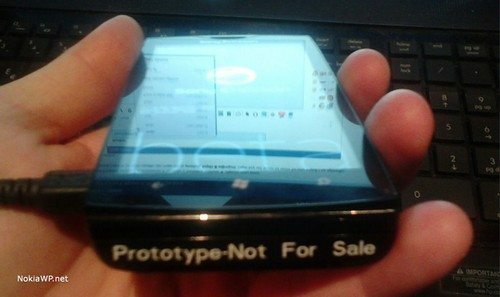 According to the guys over at Phone Arena by way of WPCentral, the people over at NokiaWP.net have come up with a couple of images of a Sony Ericsson Windows Phone prototype and the pictures show that the handset suggest that it is a side sliding QWERTY handset. The images are thus presumed to possibly be the Sony Ericsson Julie, although Sony Ericsson opted to go with Android and has said they would not develop and handsets based on Microsoft’s mobile operating system, so of course they could be old images of the Julie. However, according to the guys on NokiaWP.net this prototype handset is running Windows Phone 7.5, which could indicate that Sony Ericsson have brought the Julie back to life and have been working on it, although they are a bit confused over the SE name on the handset as Sony is splitting from Ericsson. Of course this is pure speculation s there is no hard evident that Sony Ericsson or just Sony will be moving forward with a Windows Phone handset, but as MWC 2012 is just round the corner, who knows maybe we’ll see this Windows Phone show up there, what do you think could this be the Sony Ericsson Julie?